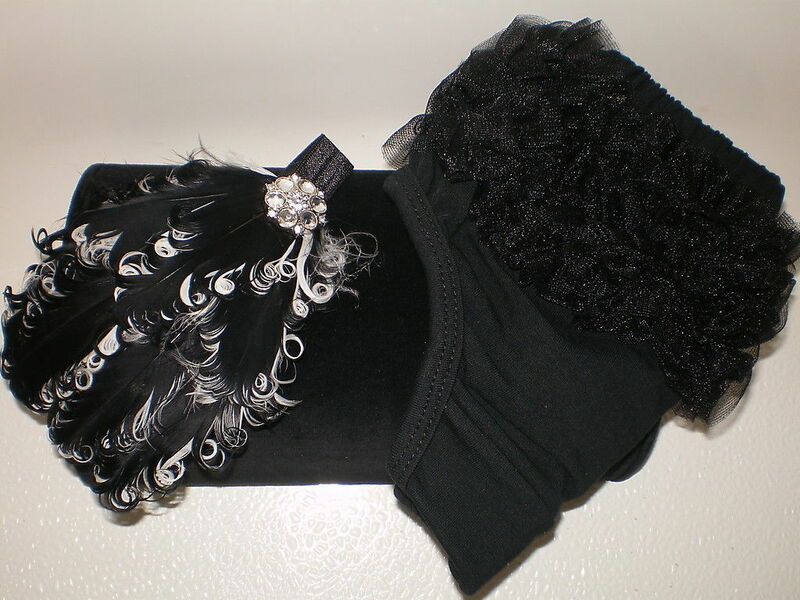 THIS IS A NEWBORN BABY GIRL SMALL BLACK RUFFLE BLOOMERS WITH A MATCHING BLACK AND WHITE FEATHER PAD HEADBAND. THEY WILL FIT 0-9 MONTHS AT LEAST OR MAYBE MORE. THE BLING ON THE HEADBAND MAY VARY DEPENDING ON AVAILABILITY. THE BLOOMERS ARE MADE OF A POLY FABRIC. 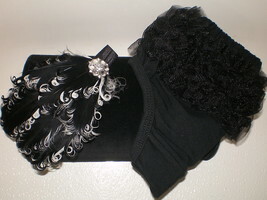 IT ALSO COMES WITH A STRING OF FAUX/COSTUME PEARLS. PLEASE GIVE ME THE HEAD MEASUREMENT, IF THIS IS NOT FOR A NEWBORN. IF I DO NOT RECEIVE A MESSAGE REGARDING THIS, I WILL BE SENDING NEWBORN SIZE. SOFT ELASTIC (3/8 5/8") BANDS FOR HEADBAND: 1. Newborn – 13" 2. Infant (1-5 months) = 14" 3. Infant (6-12 months) = 15" THIS WOULD BE A GREAT PHOTO PROP FOR YOUR NEW BABY'S PHOTO. ALL OF MY ITEMS ARE MADE/STORED IN MY CLEAN, SMOKE-FREE HOME. ***** SHIPPING ***** I NOW OFFER FREE SHIPPING TO THE USA. I STILL OFFER COMBINED SHIPPING TO MY INTERNATIONAL BUYERS, WHEN I CAN. THANK YOU FOR VISITING MIMI'S PRECIOUS DESIGNS. LOOK FOR ME ON FACEBOOK AND BONANZA.COM. I have listed this item to the best of my ability. If you have any questions, please contact me within at least 24 hours prior to the auction ending so I may reply to them. Payment is expected within three days of the auction ending, PayPal is the preferred method. The item will be shipped within five business days after payment has been received. Please leave positive feedback for me when the item arrives, I will do the same after you have left feedback for me. If for some reason, there is an issue with the item when it arrives, please contact me ASAP to address it. Powered by eBay Turbo Lister The free listing tool. List your items fast and easy and manage your active items.